Over the last two years, 19 Atchison business owners and community leaders have graduated from the Destination BootCamp program in Longmont, CO. Businesses leave the workshop armed with new strategies and inspired about their business and their community. Business expert Jon Schallert holds seven Destination BootCamps each year in Longmont, training businesses and communities how to become consumer destinations. Recently, four local Destination BootCamp alumni returned to Longmont, CO for Jon’s two-day Graduate BootCamp, which is a deeper dive into the strategies and techniques that can build a small business into a consumer destination. Jon’s message focuses on challenging entrepreneurs and/or small business owners to carve out a unique position in their market and then teaches them how to draw customers from longer distances. The group that attended included Atchison retailers and service providers. “The problem solving and networking opportunities at Destination BootCamp allow small businesses to get ahead in the race to become a retail destination,” said Angela Harris-Spurlock of Backroad Atlas. “I feel confident that the tools Jon gave me will help me bring people from further away to my businesses and help us continue to be successful even as brick and mortar sees a decline in sales,” said Scott Weinmann of Muddy River Guitars, 5th Street Mercantile, and Amazing Deals. The Destination BootCamp experience is yet another success story for the Atchison E-Community Program. Local businesses can inquire about another Destination BootCamp opportunity by contacting Justin Pregont at justinp@cityofatchison.com. 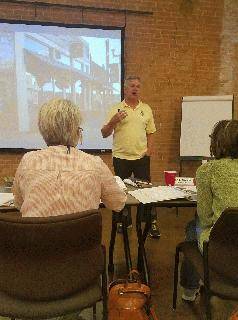 The post Four Local Businesses Double Down on Destination Business Training appeared first on Grow Atchison.